When we were talking about Cooking with Water, one of the major advantages we talked about was the ability to maintain a constant cooking temperature because of water’s boiling point at 212oF (100oC). This can also be a limitation in many ways especially if you want to cook something more quickly, or if you don’t want to add excess water to your food making it soggy ruins the flavor, and mushy making it stick to whatever you’re cooking it in. When you think about these problems, the solution most people think about almost immediately is cooking with oil instead of water because it solves both these problems. There are many advantages to cooking with oil, but you have to make sure you’re applying it in the right circumstance for the right application. In this sense, picking the right oil – this is huge! That’s right – because not all oils are created equal. There are many types, all with different flavors and characteristics that come from all different sources. Adding oils and fats to foods will change the texture of the food. This is especially true in the case of things like pastries and other baked goods. Shortening is often added in order to give foods a crumbly texture. In a nutshell, the reason for this is because when you drop fat or oil into a pile of flour, the interfacing surface between the fat and the flour forms a paste. The fat now is essentially coated with flour. When water is mixed into the flour, glutinous bonds are created giving you structure broken up by the hydrophobic bits of fat that gets incorporated as you mix and blend the fat-flour-water mixture together. Voila! Oil (and fats), by nature of its origins, has flavor. Adding it to your recipes will impart different amounts of flavor to your dish depending on how much you add, and which oil you choose. 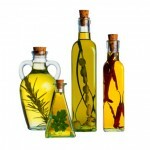 Certain oils like vegetable oil or canola oil have very little flavor. They also tend to be very light. Because of this, they generally make great, non-intrusive additions. Other oils like olive oil are much heavier and flavorful. Adding a small amount typically goes a long way, and will add a lot of flavor to your good either be it intentionally or unintentionally. Of course other fats such as pork and duck fat are rich with flavor and would make extremely poor additions in more delicate, every day cooking. Oil can also be used as a flavor transfer medium. In this case, a flavoring ingredient such as herbs, spices, or fruit is added to the oil and over time all the essential oils of the flavoring ingredient will leave the ingredient and blend with the infused oil. To do this quickly on an ad hoc basis during the cooking process, gently warm a pan (not to a searing heat), add the oil to the pan, and then add the flavoring ingredient. You want to warm the oil and the ingredient to activate the infusion without actually cooking the ingredient. You may do this with fresh ingredient and if the oil sizzles with the added ingredient, your oil is already too hot and you will have to start over. The other method is a preserve method. There is a technique to using this method which helps ensure safety which is a little more involved. The main concern is adding water laden ingredients, such as fresh herbs, or fruits. Over time, the water content of the fresh ingredients may promote the growth of certain bacteria such as botulism. When in doubt, use dried ingredients for your infusion. More on these topics in another article. Do not put the oil in the pan before it comes up to temperature because the continued heating over time, even at lower temperatures, will cause the degradation in flavor. For the reason why, see the section on smoke points below. First and foremost, most people are familiar with oil as a releasing agent and is among one of the first reasons people will turn to using oil in cooking. This is a very valid and important reason to use oil. When you cooked something like eggs, steak, or other protein-rich foods for the first time, you’ll probably remember that it stuck all over the pan (unless you used a non-stick Teflon pan) and most likely burned on one side while was raw on the other. Applying heat to amino acids and sugars causes caramelization, triggers the Maillard reaction, and this also creates bonds between the food molecules and the molecules of the pan. This may sound like an awful complicated mess, but it’s a good thing because this is how flavors are created, but more on that later. Using oil also helps your food cook more evenly. Your cooking surface may look and feel smooth, but take a closer look at the microscopic level, even. This will reveal peaks and valleys or little ridges. This isn’t a manufacturing or quality problem. This is just the nature of materials at a molecular level and polish as much as you’d like, it’s never going to be a perfectly smooth surface. Being a liquid, oil can fill in these gaps. By filling in the gaps and displacing the air in between, oil helps transfer heat more efficiently as a medium giving you the ability to cook the food on a more even cooking platform. Also, as the oil heats and coats your food, it will help ensure that your food is being cooked more uniformly all around. The oil will retain the heat and continue to cook the food even though your food is not in direct contact with the cooking surface. This allows the food to cook more quickly (being at a higher temperature) and uniformly. Over time, as you use certain types of pans e.g. cast iron in particular, small amounts of oil will remain deposited in these peaks and valleys and develop into a patina if the pan is cleaned without soap and detergents. This patina also is naturally non-stick and is a good thing depending on the type of pan. This patina is what people mean when they say they are “Seasoning” a pan. This patina actually protects the pan and also lends it additional non-stick properties. Do NOT scrape this off. Well-seasoned pans become a treasure over time. One myth to debunk at this point is that when you cook with oil, your food becomes unhealthy and saturated with grease. As mentioned above, if your oil is at a high enough temperature (above the boiling point of water), using it as a cooking medium (e.g. frying), or releasing agent should NOT cause this to be the case. The reason is the water will form somewhat of a steam barrier pushing outwards preventing too much oil from entering the food, allowing only enough to enter the outer surface to brown and cook the surface quickly. The oil as it cooks the surface of the food also forms a hydrophobic barrier which seals in juices and keeps the food moist. Animal oils primarily come from fats, or generally speaking lipids (if you recall your biology). Fats are, as a rule, solid. Both are composed of triglycerides. Most animal fats from tissue fats have a melting point of 184oC, boiling point of 200oC, and an ignition point of 280oC, with goose being a notable exception of a slightly higher smoke point. 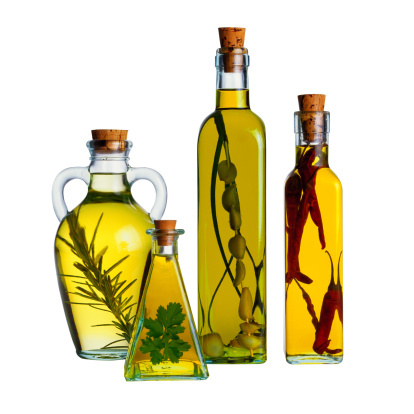 Oils, are primarily unsaturated fats which are liquid at room temperature. At the point when you’re deciding what oil (or fat) to use, you have to begin thinking about smoke points. Plant, or vegetable oils, typically have a much higher smoke point because they contain fewer impurities. The more saturated or clouded the oil is with impurities, the lower the smoke point. Ok, so what is this smoke point? The smoke point is the point at which fats and oils begin to break down creating free fatty acids, which vaporize in a bluish smoke. Pretty straight forward. When the oil reaches this point, the fatty compounds begin breaking down and this is the point where flavor and nutrients begin to degrade. Decomposition also increases as heating time increases (even at lower temperatures), which is why oils should typically not be heated more than twice (e.g. for frying). As compounds degrade, impurities form, and the smoke points drop. This, again, is the reason for the rule above to add cool oil to hot pans – which reduces the amount of time the oil is being heated. Liquids do not burn. Air mixtures do. Oil, which is volatile, vaporizes and mixes with air to become almost instantly ignitable. Flashpoints are much higher than smoke points, but they are attainable. If a grease fire occurs, do NOT throw water on it as grease floats on water and will cause the fire to spread. Call the fire department as soon as the grease fire starts. You should never attempt to handle a grease fire by yourself as the severity of the situation could escalate very quickly. It is best to disengage the stove, unplug a toaster, or otherwise remove the heat source if possible, and cover the fire with a nonflammable cover such as a pan lid. If the fire occurs inside an oven, do NOT open the oven. Let the fire burn out as it will consume all the oxygen in the confined space and starve itself. Of course in most of these cases, the grease fire can become a very serious situation very quickly and usually occur when the cooking fats and oils are left unattended. Never leave it unattended while cooking!